Melissa Sopwith of ESI Ergonomic Solutions says sales of her firm's height-adjustable tables/desks and sit-to-stand workstations have increased over the past couple of years. She expects sales to grow through 2017. Our recent GPN-American City & County poll shows 53 percent of respondents believe that standing desks boost productivity. Almost 4 out of 10 respondents believe that more of their co-workers will be doing their jobs at standing desks in the future. A total of 314 government officials and others took part in the poll. GPN reached out to Melissa Sopwith, director of marketing at ESI Ergonomic Solutions, to find out the status of standing desks and related products in the workplace. Below are Melissa Sopwith’s views. GPN: Are more workplaces furnishing their offices with standing desks today? Melissa Sopwith: Yes — more office environments are using standing desks because more employees are asking for them and more companies, governments and other organizations are realizing the health and productivity benefits of having standing desks. 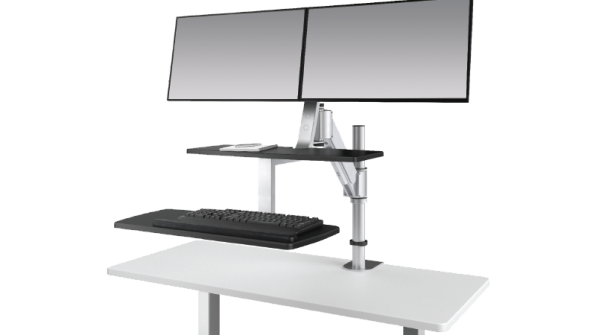 For ESI Ergonomic Solutions, sales of height-adjustable tables/desks and our sit-to-stand workstations have increased over the past couple of years. Due to the increase in demand, we have also launched additional sit-to-stand products for workers. Two of our top-selling sit-to-stand workstations are now available on GSA contract as well. The Lift and the Climb are two of our firm’s newest products. The photo to the left shows the firm’s ErgoriseLift model. GPN: Will more offices/workplaces start using standing desks through 2016 and into 2017? MS: We have already seen more demand for sit-to-stand desks in 2016, and we expect that to continue. Executives are realizing that making an investment in their employees’ health and well being by doing such things as providing height-adjustable desks, will pay off in the long term. The long-term benefits of sit-to-stand desks outweigh the costs. Employees who use sit-to-stand desks report that they feel better and are more productive when they can transition from sitting to standing at their workstation throughout the day. GPN: Are standing desks a healthy alternative for government workers and other workers? MS: Absolutely. Giving workers the option to sit and stand throughout the day is a healthy alternative. Having options is good. With a traditional desk, you do not have the option to stand. You are forced to sit to complete your work. But with a sit-to-stand desk, workers can choose when they feel like sitting and standing. They can listen to their body and do what’s best for their own individual needs. In the video, see some of the features in the ESI Ergonomic Solutions Climb and Climb2.